PT = Programming Track, for programming mobile DCC decoders. This dialog is entirely in English to reduce space. The default, first in the list, Command Station is used for programming unless another is specified in the Rocrail General settings. The dialog is simple but capable of doing all programming tasks. You can even save and load all your CV's from previous sessions. 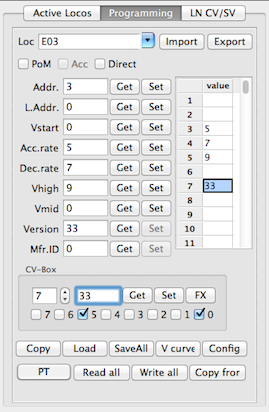 It is also possible to edit bit wise CV values. It does not feature a characteristic diagram because most of the decoders will be operated with 128 speed steps which does not support this. export/import CV's from and to a *.CSV file. Just put a loco on or connect an accessory decoder to the Programming Track and push the Get/Set you want. The dialog is disabled when a Get or Set is in progress. Select a row from the table to edit the value with the CV bit checkboxes. Select from the pulldown listbox the Loco you want to program. The fields of the dialog will then filled with the earlier saved values. (if already which have been stored) See here: Loco dialog 'CV's'. All CV values in the grid are saved in the loco properties. After a restart they will be showed in the Loco dialog 'CV's' and can also be modified. The value in the CV-Box is copied into the grid. With the Load button you can get a specified saved CV value. After programming is done you can copy a new single value with the Save button into the grid. With the Read all, Write all and Copy from buttons you can program your new decoder with stored CV's or secure all the CV's from an existing one. With the Copy from the stored values from the selected Loco are preseted form writing them in another decoder. The Copy from button opens a dialog for selecting a loco from which you want to copy all stored CV's from. You can write all values to the decoder with the Write all button or selectively Set the values you want. Direct byte mode is the most common method for programming decoders. If this option is not set some Command Station will swap to page mode. Some Command Stations support POM. Check you CS documention if it does. Caution: Under certain circumstances you will program all Loco's with the same values on the main track!!! The address field must be set when using POM. Saving CV's in this mode is not supported. DCC Accessory programming on the main. Only available if POM is set. After reading the Manufacturer ID, the manufacturer name will be available as tool tip. Opens a comma separated value, *.csv, list from file. Only one pair per line. The file is completely parsed before all values are written to the decoder. Note: The last CV value is used in case it appears multiple in the imported file. Saves all cv's in a comma separated value, *.csv, list into a file. Use L.Addr. to read or write the long decoder address. Set bit 5 of CV29 to '1', or add 32 to the current CV29 value, or use the Config dialog and check the “Extended addressing”. Calculates all speed values lying between step 1 and 28 on linear basis. Calculates all speed values lying between step 1 and 28 on logarithm basis. The 28 new values will be written to the decoder. Set bit 4 of CV29 to '1', or add 16 to the current CV29 value. 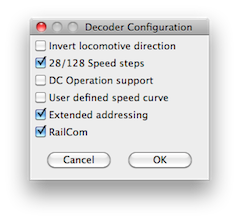 Or use the Config dialog and check the "User defined speed curve". CV 29 can be setup by dialog because the meaning of the bits are standardized by the NMRA. The dialog text is self explaining, but read the decoder manual at any doubt before proceeding. This is for setting up light effects in Digitrax mobile decoders. 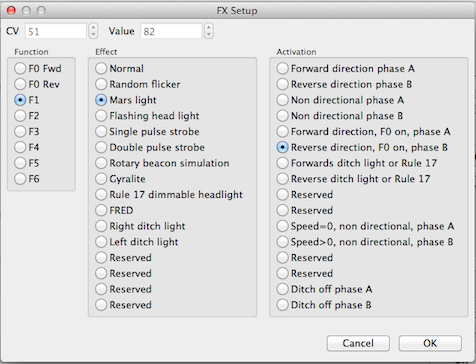 See chapter 6.10 "Special Light Effects" of the Digitrax "Mobile Decoder Manual". Write the wanted number to setup in the CVnr field before launching this dialog.